Gloria (Lorena Velázquez) discovers that her father, who was studying voodoo in Haiti, has vanished. Meanwhile, a mad scientist is capturing people and turning them into remote controlled zombies. He then arms them with personal blowtorches and sends them out to rob banks. One detective (Irma Serrano), who is a big Santo fan, enlists the silver masked man in helping them uncover the identity of the hooded maniac behind the zombie related crimes. Oh, and the zombies try and kidnap a bunch of orphans at one point, but I don't know what that had to do with anything. "Look, this is the third time you've call me here to find your TV remote." 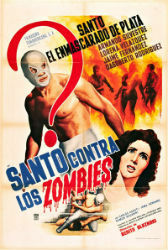 Invasion of the Zombies is Santo's third film but the first that was shot in Mexico. 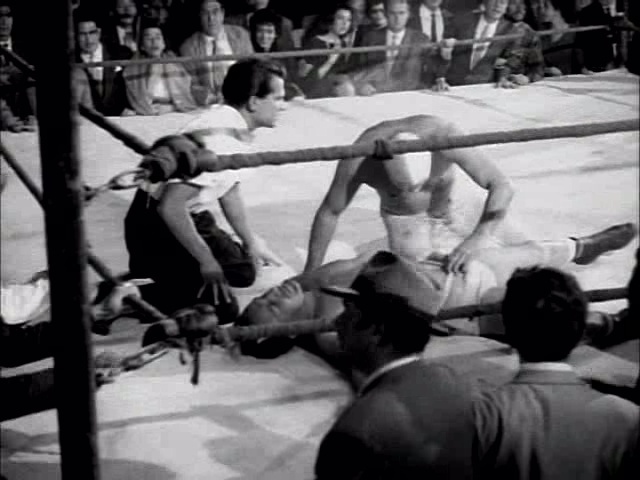 Santo's opening bout establishes him as not only a wrestler, but something more to the throngs of fans that carry him out of the ring on their shoulders. We're introduced to his secret lab complete with two-way video communicators (something that creates a bit of lazy storytelling later on in the film). This is all serves to make him a rather unique combo of superhero and folk icon. Invasion of the Zombies suffers from some listless camera work and a slow pace, things that don't serve an action film at all. Although this movie does manage to pour on some wonderfully spooky atmosphere thanks to the mad scientist's lair, and some choice violence. The story never so much as cracks a smile, even when Santo is pulling a smoking remote control out of a zombie wrestler’s shorts. Since this is an early Santo film, there really isn't much to Santo himself. It feels like they want to make him a mysterious blank figure. He doesn't have much dialogue, he basically only functions to wrestle, and save the day at the end of the movie. Later films will begin to let some of the personality behind the mask show through, but in this early formative film, he's a cypher and not a terribly interesting one at that. "Uh, Santo, can this wait till after the match?" The entire film feels rushed, the action scenes are only partially choreographed and shot very flatly. Rather than look for interesting ways to have Santo show off his detective skills, he is just able to use his two-way communicator to somehow spy on the bad guys. It all feels lazy and unsure of how to proceed. I think the simple story could work well enough with some more care. This might have been a good one to revisit later in Santo's film career once he and the filmmakers had a better grasp on how to use him. Not his worst film by any stretch, but is it rough enough around the edges to give casual Santo fans pause. However, if you are curious about the origins of Santo's film adventures, it is perhaps worth checking out once, and then you can move on to his more interesting movies. You might feel a bit like a zombie yourself after watching this one.